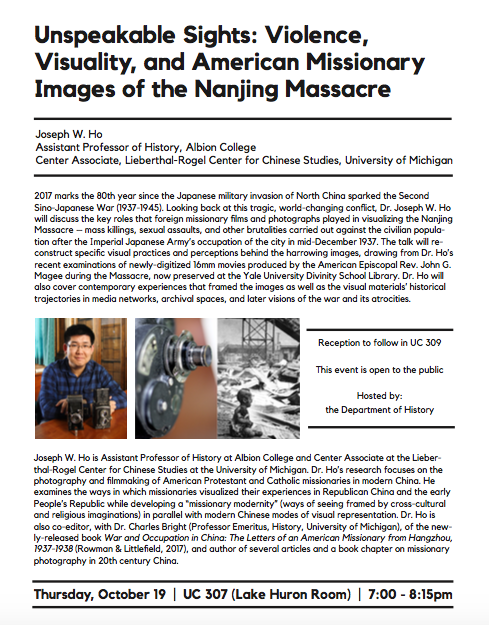 Dr. Ho will present "Unspeakable Sights: Violence, Visuality, and American Missionary Images of the Nanjing Massacre." We hope you join us for this event which is free and open to the public on Thursday, Oct. 19 from 7-8:15 pm in UC 307. Grad students, join us for this presentation and practice session all about the job market. Thurs. Oct. 19, PO 121 from 2-3:30 pm.